The following was written and sponsored by Broker/Realtor David Garves along with information provided by Eric Bloomstrand of Bell Bank Mortgage. With strong numbers across the board, faded are most people's memories of the housing crisis, foreclosures, short sales and upside down mortgages. With only a few home owners still feeling the impact of the housing bubble - 2016 continued to build confidence that the Maple Grove market is strong and safe as home owners again felt the excitement of equity improvements in 2016. Demand for a Maple Grove home by buyers continued to grow in 2016 resulting in the highest number of home sales in more than 10 years within our city. With 1,462 sales, there was more than a 5 percent increase in home sales during 2016 than the previous year (see chart below). 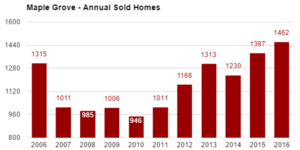 The increase in home sales is even more impressive considering that new construction is still just a trickle of what it had been within the Maple Grove boarder. In 2016, only 46 of the home sales were the result of a newly built home, down nearly 50 percent from last year and off the 2010 peak by nearly 80 percent. 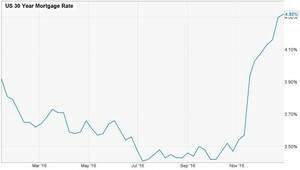 While interest rate increases may have an impact on total 2017 demand (see Eric Bloomstrand's comments below) there seems to be no shortage of demand heading into first quarter of 2017! Months of inventory - The heavy demand and closed sales by home buyers together with the lack of new listings in Maple Grove has left us with the lowest months of inventory numbers we’ve seen in Maple Grove for decades. By the end of 2016, we were left with only 1.1 months of inventory for home buyers to shop for - down 45 percent from the supply number a year ago and the lowest mark on record for Maple Grove housing supply! 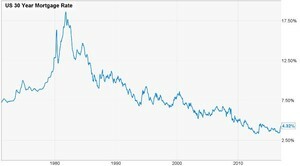 Foreclosure and Short Sale Market - Besides the lack of new construction homes noted earlier, the lack of supply is also a result of an improved economy that no longer brings bank mediated homes to the market. While once accounting for approximately 35 percent of the supply of homes, only 74 Maple Grove sales in 2016 were the result of foreclosure or short sales - about 4 percent of the Maple Grove housing market. While it’s nice to be “back to normal” and to have a strong seller's market - there is a huge need for new homes coming onto the market in first quarter 2017. At some point, a lack of homes to look at will result in a lack of interest in our community and buyers purchasing in other locations. 2016 saw a very healthy and very positive increase in home values. 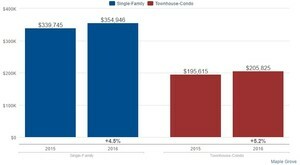 With demand low and supply high, both single family homes (up 4.5 percent) and townhome/condo’s (up 5.2 percent) made home sellers happy with solid gains on median home price compared to the previous year. Price Per Square Foot - Breaking a home down into little squares and pricing each square is always a good way to compare market strength. 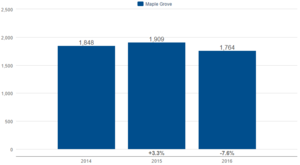 Like most of the other data, Maple Grove had a good year here, too, as the average price per square foot improved by 5 percent from last year to $128 per square feet in 2016. This is the highest price per square foot in Maple Grove since 2008. It was a good year in Maple Grove real estate. To see previous monthly reports on the Maple Grove real estate market, check out: MapleGroveRealEstateInfo.com or for any questions regarding the Maple Grove real estate market, contact Broker/Realtor David Garves call/text: 763-221-5834 or email dgarves@TheMLSonline.com.